The AN/PRC-160(V) is the market’s only standalone solution for Beyond-Line-Of-Sight communications in the absence of satellite. This wideband system is also the world’s first and only HF manpack meeting new NSA crypto-modernization standards. Its software-defined architecture allows encryption updates, so mission-critical information stays secure–today and into the future. Harris leveraged 50 years of engineering expertise to deliver new generation HF capabilities in the AN/PRC-160(V). The manpack’s data speeds are up to 10 times greater than any existing HF radio, giving warfighters the power to share higher-speed communications and more sophisticated ISR through long-haul connectivity. 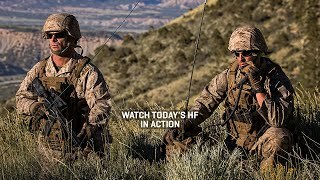 The HF/VHF Tactical Radio System features software-programmable Harris Sierra™ II encryption, providing secure Type 1 interoperability among U.S., Coalition and Partnership for Peace forces. The manpack is fully compatible with Harris Falcon II® HF gear, supporting immediate installation using existing Harris vehicular and base station equipment. This wideband system is also is the smallest, lightest, fastest wideband HF manpack available, SWaP-optimized to increase battery performance while reducing warfighter battle load and fatigue. Why is HF your most resilient BLOS choice?